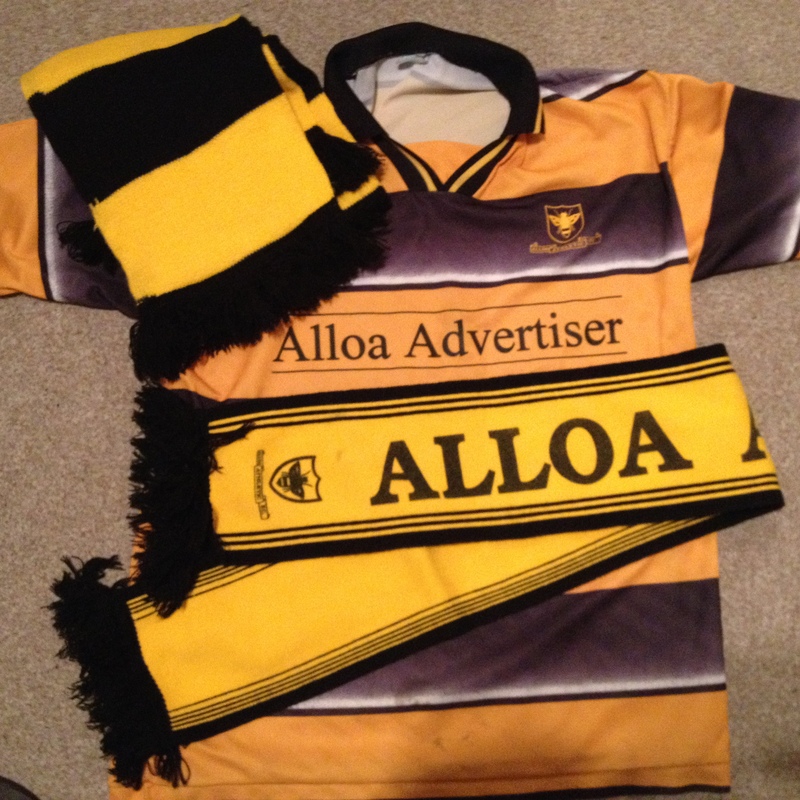 There was never a time in my life when I decided to support Alloa Athletic. It certainly wasn’t a matter of familial tradition, given my auld man loathed ‘fitbaw’ and all my uncles – all of them – are Huns (don’t judge me). No, the mighty Wasps have been a part of my life for so long they may as well be part of my DNA. I simply can’t remember a time when I didn’t love Alloa Athletic. After a spell in Alloa’s infamous ‘Bottom End’ my auld man got us a flit to the Hawkhill scheme and our house on Thistle Street was a scant few hundred yards from the hallowed ‘Recs’ (now horribly renamed the Indodrill Stadium). For as long as I can remember the Saturday afternoon roar of the crowd excited me to a degree that compared to nothing else in my pre-pubescent life. The hordes of black-and-gold-scarf-wearing men streaming down Thistle Street and along the Clackmannan Road thrilled me to bits. The fact that these ‘hordes’ totalled an average gate of around 450 in the mid-70s and the ‘roar of the crowd’ was little more than a semi-excited murmur was something I wouldn’t learn for a number of years. My gran knitted me the traditional Alloa bar scarf of back-and-gold and on match days I’d wear it hanging around at the end of our path, soaking up the atmosphere, vainly trying to be all nonchalant, as the local hard-men and their equally hard kids, similarly bedecked, would saunter by and cry out “awright there, wee man? Ye no’ comin’ doon the game then?” I’d casually explain I was waiting for a pal. It was easier than the derision which would inevitably have accompanied the truth; that my folks wouldn’t let my nine year-old self anywhere near a football ground in the hooligan-infested seventies. At age ten, Kenneth Greenhill and I pulled the time-honoured childhood blag – I’m at his and he’s at mine – on our respective parents. The pre-internet age, no mobile ‘phones and with only about three landlines on my scheme and a similar number on the Mar Policies – Kenny’s scheme – meant we were pretty safe. So off we went. Handing over our forty pence and clicking through the turnstiles, trembling with excitement. The noise, the colour, the spectacle; the experience was enormous. All of which I’d many years later realise, after visits to Parkhead and Ibrox, was nothing of the sort. But then, my love was requited. We were joined. Then came the second broken heart of my young life. The first being Eleanor McGill kissing Gary McPhail at the primary seven Christmas party. It was 1978 and we were on the march with Ally’s Army. The entire nation had gone mental. Scotland had already won the world cup before we even set foot on Argentinean soil. If you weren’t there, you simply can’t imagine. It was insane. You’ll recall how it ended though and as I sat there, after Archie scored that goal and it simply not being enough, tears streaming down my eleven year-old cheeks, the auld yin cheerily remarked, “you think that’s bad? Next week we’re flitting to England!” He wasn’t joking. If life hitherto had contained challenges, they were as nothing to the tribulation of those first three years in Nottingham. A stranger in a strange land, the odd kid with the weird accent, with no fresh rolls from Williamson’s bakers next to the Recs of a Sunday morning, no square slice from Aitken’s, no Ochil Hills, no cousins, no pals, no tablet and, even more devastatingly, no Alloa Athletic. The 5.00pm results on the BBC and no match report in England-oriented Sunday papers were as good as it got. And that wasn’t any good at all. Relief efforts from family came in the form of the Alloa Advertiser posted down every now and then, so some connection to my own true love could be maintained. But the fag-end of the seventies and the early eighties were our wilderness years; the period when our star-crossed relationship was defined by the estrangement enforced by insurmountable distance. When love threatened to tear us apart. Grimly, I hung on, spurning the would-be temptresses of Nottingham Forest, Derby County and Notts County. By then I’d made a few pals. They urged me to move on. To get over it and find a new love. But I couldn’t. While my brother would eagerly lap up any game on TV, English football meant nothing to me then. Without a dog in the fight, it seemed remote. Disconnected. Forest in those days, under Brian Clough, were on the cusp of their golden years with European glory winking sexily just over the horizon. I remained unmoved. We love who we love, right? We don’t choose that love. It just is. Adulthood, money and, crucially, a driving license meant our relationship finally moved seriously to the next level. The ups and downs that followed were easily absorbed, given the previous challenges we’d met and conquered together. 620-mile round-trips via plane train and automobile were taken in my stride. Like the time my best pal – or ‘ma big neebur’ as we used to say in Alloa – Stiobhan and I made a weeknight roundtrip visit to Ibrox for a cup tie. Stiobhan, a hulking Welshman, committed republican and equally committed Celtic fan, considered several hundred miles behind the wheel of his Mini small beer for the remote chance of seeing his pal’s wee diddy team inflict a humiliating blow on the Evil Empire. I was working in a dyehouse at the time and my shift finished at 2.00pm. He picked me up and we drove the 320 miles there, saw the game, had a curry and a couple of drinks and then drove straight home. Arriving back at work in Nottingham at 5.30am, just in time for my next shift. We figured we’d sleep when we were dead. Looking for parking in Glasgow’s south side, it became apparent we’d need to ask for directions. Stiobhan, worried his obviously Welsh accent might still be mistaken for English, instructed me to do the talking. Which I did. Slipping instinctively into the patois of my youth. He needn’t have worried. After all, at Ibrox, only an orange sash, a bowler hat or a Union Jack would receive a warmer reception than an English accent. The highs and lows have been many. The nail-biting ’98 league-winning season, for example. When my wife had given birth to our youngest son just two days before the last game of the season. Which my eldest son and I still attended. Obviously. Then the time our goal machine, Willie Irvine, a prison officer in his day job, threw crucial fixtures into doubt when he was taken hostage by a prisoner at Glenochil jail. Or when Martin Cameron – butcher’s boy by weekdays, the black and gold Ronaldo on Saturdays – was out for three games because a frozen cow had fallen on his toe. Or something. And who can forget the glory of gubbing the hated Stirling Albion 7 – 0? And so all the way up to this season where already relegation is a distinct possibility but has provided a win against Hibs and the hated Huns pushed to a draw. We sail those storm-tossed seas of fate, smiling together and will continue to do so. Till death do us part. Ours is a love supreme.